The trade conflict between US and China has dominated the market narrative lately. 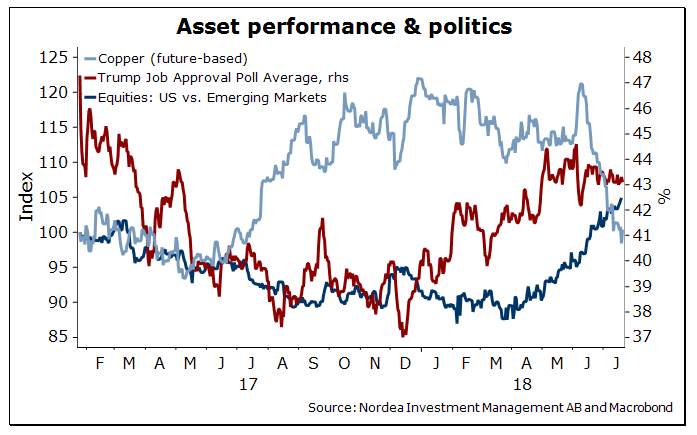 So far, market reaction and the desynchronised slowing of the world economy are clearly pointing at the US as the relative winner of this conflict. It is difficult to argue that rising protectionism creates winners in absolute But in relative terms, the picture is different. Based on market action, the US is the clear winner of the recent trade conflict with China – not surprisingly: China has benefitted much more from exports to the US than the US has benefitted from exports to China. And while US growth is supported by tax cuts in the near term, Chinese growth is dragged down by slowing credit creation, contributing to a desynchronised slowing of the world economy. Consequently, the US is the best performing equity region year to date, while China and emerging markets are on the other end of the scale, wiping out last year’s impressive outperformance within a few weeks. And as trade jitters intensified in June, defensive equities had their best month since 2016 (US data). Where do we go from here? Assuming that trade policy is an important part of the US President’s strategy to a) perform well in November’s mid-term elections and b) prevent the US from being overtaken by China as the world’s economic leader, he has plenty of reasons to believe that the current strategy will pay off. China, on the other hand, has weaker cards at hand. First, note that Trump’s approval rating climbed as the trade conflict heated up in the first half of the year. Secondly, Dr. Copper’s steep fall signals growth weakness in China, the world’s largest consumer of the commodity. The bottom line: Based on the current state of play, there seems to be little incentive for the US to change its trade policy; whereas China, with its vulnerable economy, can only react. US equities, as well as more defensive equities in general, should therefore continue to do well in the second half of 2018, making this year’s market picture look much different than 2017.